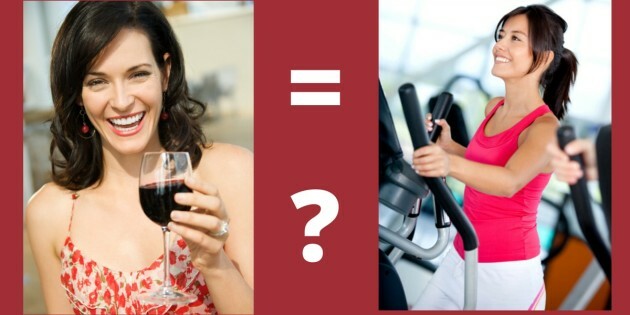 Glass of Red Wine Really Equal an Hour of Exercise? Does One Glass of Red Wine Really Equal an Hour of Exercise? Facebook headlines are popping up about a study showing that drinking red wine produces the same benefits as working out for an hour. After the 4th or 5th person has asked me about this study over the last few months I’ve decided to create a regular feature on my blog: Debunk the Junk! Clearly, there is a great desire for this headline be true. I did a quick Google search and out of only five different blog posts or online magazines that have re-hashed this article there were 5 million shares on Facebook! It doesn’t really have the same appeal, does it? I want to be clear that I am not saying that the study itself is junk – it appears in an respected peer-reviewed journal and follows good scientific principles. The Junk is the blogs and other publications that have twisted the information touting incorrect and misleading results. 1. The study is looking at Resveratrol, a compound that is founded red wine that does have some very fantastic benefits related to exercise performance. The rats (not people) were given 4 grams of resveratrol per kilogram of the food that they ate, which is approximately 146 mg per kg of body weight. 4. Based on body weight, someone weighing 150 pounds (68 kg) would need 9.9 grams per day. 5. Depending on the varietal red wine contains 0.06 – 1.86 MILLIGRAMS per 150 mL (or 5 ounce) serving. 6. Using the highest number (Spanish red wine) 1.86 milligrams, and the goal dosage of 7.24 grams that equates to…..
3,892 (5 oz) glasses of wine PER DAY! Am I suggesting that you MUST take a resveratrol supplement? No. It is up to you, it is safe to take and you may find it is beneficial. I am, however, suggesting that if you’re going to enjoy a glass of red wine – simply enjoy it and don’t think that you can skip going to the gym! You may have some friends that bought into the myth…please consider helping them by sharing with the blue button.